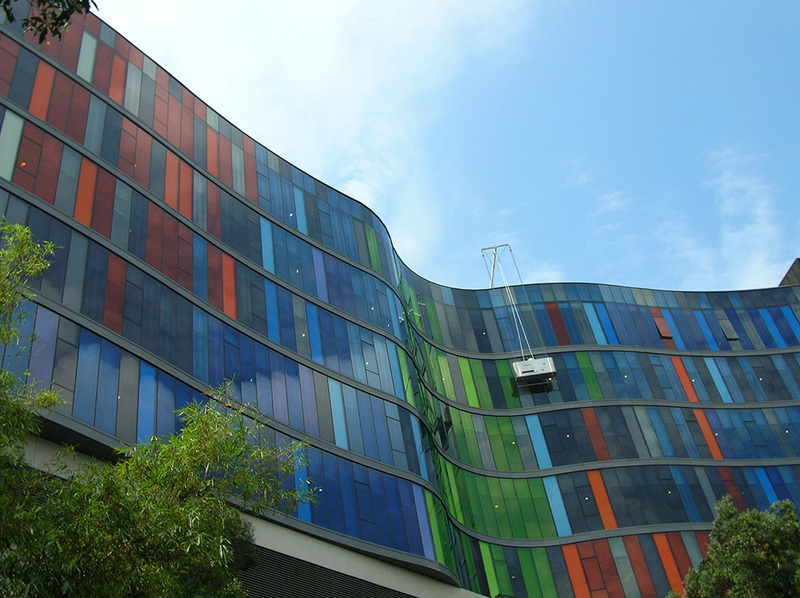 The CoxGomyl 1000 Series range is often thought of as providing relatively standard facade access solutions for buildings of lower complexity. While this is certainly true, it is only part of the story. The 1000 Series encompasses a whole host of machines, techniques and approaches which CoxGomyl are able to draw upon and use in clever combinations to deliver practical access solutions for buildings of lower height which, are nevertheless some of the world’s most incredible construction projects. The imagination and expertise of our design team allows them to develop simple and economical building access systems by leveraging all the possibilities offered by the standard equipment in the 1000 Series range. Systems based on travelling Building Maintenance Units machines on the roof of the building with options for drum hoist machines and light-weight or larger trollies with self-powered cradle. Systems based on various types of roof rigs and travelling gantries, encompassing access solutions such as monorails, davits and gantries, all of which can be deployed in conjunction with a range of self-hoisting platforms. The new Midfield Terminal development at Abu Dhabi airport is far from an unremarkable, small scale building but it will benefit from a combination of the wide range of simple and economical building access solutions provided by the 1000 Series. The bold expansion initiative features a new passenger terminal between the two runways, the main building and centrepiece of the airport. The terminal building will be the largest in Abu Dhabi with 700,000 m² of internal space and will be visible from more than 1.5km away, capable of processing 30 million passengers a year or 8,500 passengers per-hour. In addition to the travel operations themselves it will also offer 35,000 m² of duty-free shops, dining and entertainment. The staggering scale of the development continues with one of the world’s largest arches spanning 180m across, a roof span of 319m at widest point, 115,000 m² of external glazing and 275,000 m² of aluminium cladding. The highest ceiling, however, is only 52 metres at its highest point. Clearly this new mega-facility is immense, iconic and state-of-the-art so nothing less than a complete and reliable building access solution would be fit for purpose. The unique combination of standard products CoxGomyl provided to service the huge surface area includes more than 11 kilometres of monorails, 54 trolleys and 27 BMUs. Although the individual elements are simple and economical, the way in which they are combined and deployed will ensure the upkeep of this important aviation hub for many years to come. 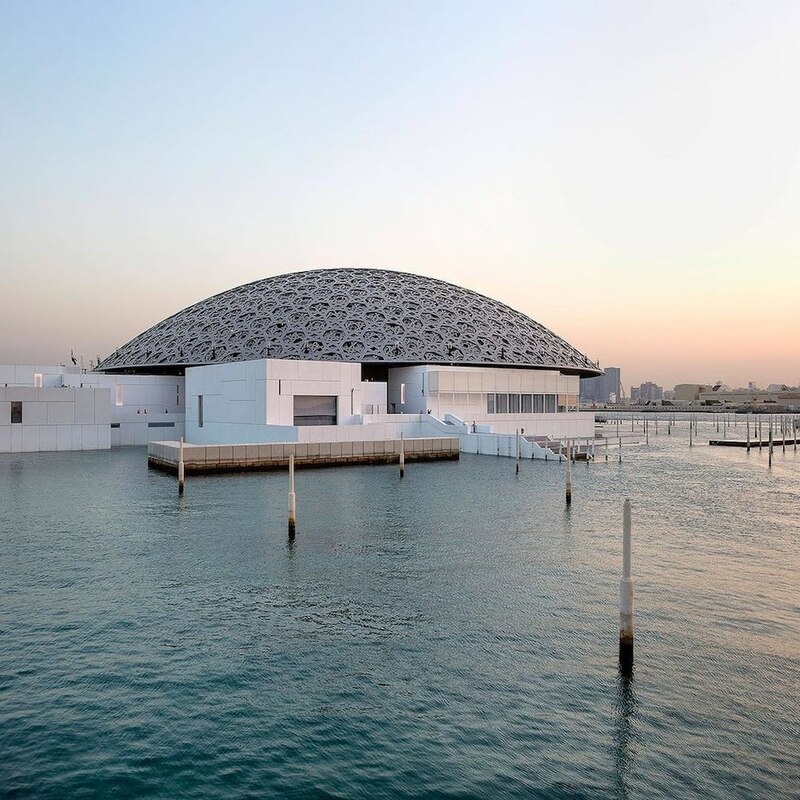 Another immense construction project in terms of both concept and scale, The Louvre Abu Dhabi is approximately 24,000 m² in size with 8,000 m² of galleries, making it the largest art museum in the Arabian Peninsula. Part of a US$27 billion tourist and cultural development, the new museum is linked to the Paris Louvre and will showcase work from their collection and other museums as well as developing their own collections, all intended to emphasise the dialogue between civilizations in the field of the arts. Like the Midfield Terminal, The Louvre Abu Dhabi is an immensely ambitious, complex architectural and construction project which covers a huge surface area combined with a relatively low height. Again, this means that a clever combination of numerous simple and economical 1000 Series machines is more than capable of providing a complete a practical building maintenance system for this important new cultural institution.